Today, more than half a century after L. Ron Hubbards expedition along the wild and thunderous coastline of the Pacific Northwest, his legacy to mariners continues to be of service. Within the National Archives in Washington, D.C., a number of unassuming gray boxes each contain a collection of index cards bearing observations by seafarers regarding the coastlines and waterways of the world. These cards and their reports are referred to by government agencies to compile and edit the coastal pilot books and official charts relied upon by sailors and commercial vessels of every nationality and flag. Thus, the numerous reports on the British Columbian and Alaskan coastlines submitted by Ron are still in use today. The testing of the Nomograph had also proved that radio navigation could be greatly speeded and expanded in scope. Additionally, Ron found radio signals to be of use to small yachts deep at sea due to the nomographs ability to calculate ones position in terms of longitude and latitude. No longer did a yachtsman need to use numerous charts, spread out over the cabin table or galley counter, to draw the long intersecting lines from the radio station beacons to a fix far out at sea. There was, however, another more far-reaching contribution made by Rons radio direction finding work. Although no one could have foreseen it, his research with the nomograph soon played a key role in the Navys development of the LOng RAnge Navigation system (LORAN), one of the most widely used navigational aids of the century. Using LORAN a ship or aircraft can determine its position through the difference in time between radio station signals sent from two or more known stations. Rear Admiral Chester Nimitz, later commander of the United States Pacific Fleet, requested Rons presence in Washington, D.C., to be fully debriefed regarding his expedition and the details of his navigational experiments. The formula he discovered gave the Navy its first important breakthrough and the basic foundation for the development of LORAN. As a result, Navy navigators and pilots, and later commercial vessels and yachts, were able to pinpoint their position instantly on a chart without the necessity of plotting bearings. From the mid-1940s, the use of LORAN grew to become the most widely used navigational method aboard sea-going vessels of any size. 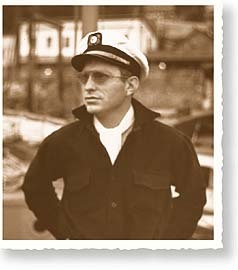 It is not surprising that with the outbreak of hostilities and World War II, the Navy was anxious to enlist L. Ron Hubbard, who went on to serve as commander in both the Atlantic and the Pacific theaters. The final proof of the value of Rons nautical accomplishments came shortly after his return from Alaska. He was granted certification from the United States Department of Commerce as "Master of Steam and Motor Vessels," and three months later his authority was expanded to "perform the duty of Master upon Sail Vessels... upon the waters of Any Ocean." "There is something magnificently terrible about a savage sea in the unwholesome green of half dawn, when the clouds draw down a heavy pall as though to keep out any possible rays of false dawning, when the headlands seem within inches and loom like tombstones, when the waves are sullen shadows leaping by. The ship is an unreal, fragile thing, full of strange groans, and engine and sails are dwarfed in their puny power when matched to all the countless horsepower in wave and wind and current. The whole world is an awesome threat. Alone, wet, hungry, hand cramped upon a tiller, a sailor knows more truth in those hours than all mankind in his millions of years."